Last night I watched The Social Network. Facebook may have had a movie made about it, but that's not such a big deal. You don't really arrive until you have a post dedicated to you on Chaka's World. You can find my official review of the movie at The Movie Guy. 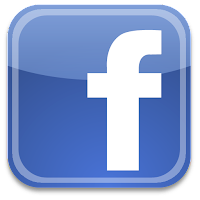 I like Facebook because to me it's like a giant online Rolodex that gives me access to most people I know. I still have about 4 friends who are holding out on it and refuse to join for some reason. Maybe because they don't want to be rounded up and sent to the government prison camps. 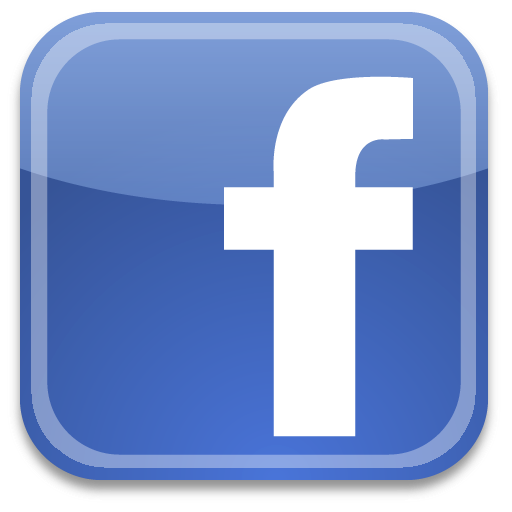 (You thought FB was just a social media program?) Anyway, as much as I like Facebook, I have some pet peeves about it which I will share below. Chat- It may be handy at times, but usually I find myself being asked "What's up?" by people who don't really have anything to say. I hate being interrupted and feeling obligated to carry on a superficial conversation. Poking- Whoever came up with this feature should be punished. The annoying cousins of poking are having virtual snowballs or pillows fights. Games- I hate getting invitations for games involving vampires, farmers, mafia, zombies, fairies, etc. I already waste enough time online as it is. Excessive Updates- We don't need to know what you eat every meal or any details about the frequency of your bowel movements. If you need to report every single detail about your life get a Twitter account. Being Tagged in Photos- Occasionally someone might post a nice photo of you, but I frequently see people tagged in embarrassing high school date pictures or old poor quality photos. The Hacking Threat- I fell for a message that my cousin sent me about a funny picture of me she had posted. Someone had hacked her account and I was dumb enough to click on the link and as a result, my account was sending out similar stuff to my contacts the next day. Despite these annoying items, most of my friends make Facebook an entertaining experience. I appreciate those who post meaningful, witty, or entertaining stuff. Facebook may be a site that gives us a false sense of friendship where we practice superficial social skills, but it I still like it...sometimes. Last year my son came home with a drum set. He said he bought them from a friend for $100. At first I was concerned about the noise they'd make and pretended that I didn't approve, but then I remembered how I have always wanted to play the drums since I was a little kid so I was secretly excited. 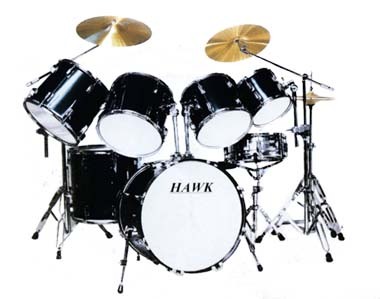 I wanted to play the drums in Jr. High, but my mom was smart. She bought me some drum sticks and a leather drum pad and told me if I could practice consistently, then she would look at getting me a drum kit. Practicing rhythm drills on a leather pad is not fun so she never ended up having to fork out money for them. I was going to be a famous drummer like Neil Peart, Buddie Rich, the little drummer boy, or Animal, but I never ended up launching my massively successful drumming career. I still think drums are the coolest instrument (if you don't count the tuba, piccolo, or bassoon.) Sorry for the sarcastic slam if any of you play those instruments. We've had the drum set for over a year now and I still don't have the will to practice or get good because whenever I try playing them, my kids just roll their eyes. You know you have no rhythm when your 4 year old girl shakes her head and walks out of the room while you are demonstrating your skills. The drums were recently given away again and continued their circle of life where they will bless the life of another family who will tinker with them several months before they pass them on to someone else like Amish friendship bread. I have mixed feelings when it comes to fortune cookies. First of all, to my Chinese friends, is a hard cookie really the best dessert you could come up with? I love Chinese food, but anytime I go to a Chinese buffet they only have weird desserts like cookies, pudding, pear slices, or jello. Come on! You guys invented paper, printing, the compass, gun powder, etc. I know you can do better than a dessert that makes you feel like you are eating a dog biscuit. One the positive side, fortune cookies do have more mystique and mystery surrounding them than most other desserts. I'm sure no one takes time to reflect and contemplates future life choices when they eat a donut and I doubt eating an ice cream cone makes one ponder your destiny either. By the time I finish eating delicious Chinese cuisine, I am loaded up on sodium and MSG and I could use some good old fashioned sugar to balance out my diet. Isn't that what yin and the yang is all about? 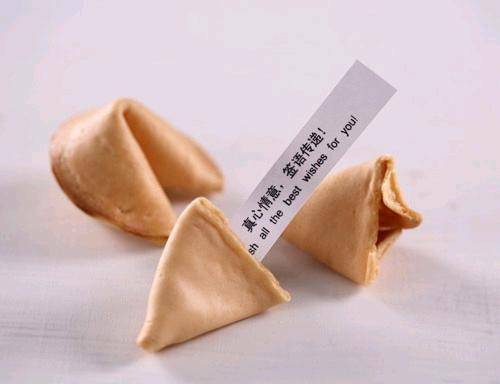 So couldn't you offer some better dessert or at least put some frosting on the fortune cookie? Now that I think about it, I wouldn't have any problem pulling soggy fortune papers out of banana cream pie if you put that on the menu. I consider myself an expert on haircuts because I've been getting them for a long time. I also frequently cut my own hair and I've been cutting my 7 boys hair for over 15 years. I'm sure all the women who have licenses from hair academies and salons would frown on my skills since I'm limited to an electric razor, but I probably have as much chair time as many young new hair stylists. Now that I've professed my expertise, I thought I'd share a few of my haircutting insights. 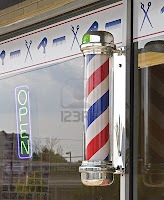 The barber pole- This is something you don't see as often these days. 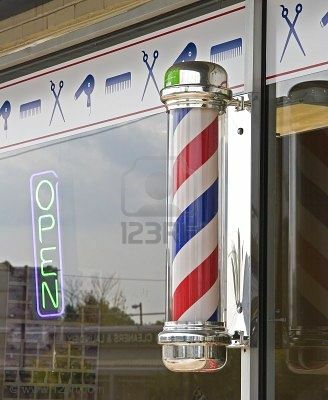 Maybe because it's origin is from medieval times and the red stripes represent bloody bandages wrapped around the pole since many barbers were involved in surgeries and blood letting. Some advice- Be careful when you use the phrase "finger tight on top." This length can be vary greatly depending on your stylist. I once requested this from a large Polynesian woman with big fingers, but I could hardly tell my hair had been cut when she was done. Vacuums- Don't look down upon a hair cutting establishment if they use vacuums to clean off your shirt and hair after. I like to have my hair vacuumed. I don't care how fancy a salon is, if they don't vacuum your head after, you are getting jipped. The neck shave- This is the best part of a haircut. I love trimming up the scruffy peach fuzz and giving someone a clean cut look. Least favorite part- Being asked if you want your eyebrows trimmed. When someone asks you that, it is worse than being called sir for the first time. It means you are getting old. At least I haven't had anyone ask if they could trim the hair coming out of my ears yet. After reviewing several of my recent posts, I just noticed a trend. I've recently confessed that I'm not really into the NFL, I'm bad at home repairs, I'm scared of insects and snakes, and I cut hair. Some people might jump to conclusions but I'd like to make it clear that I am still a very manly man. Now if you excuse me, I have to go work on my next post which is on the topic of the ten most fabulous figure skating ensembles of all time. And I thought Sumo wrestlers could only do this on Clydesdales. 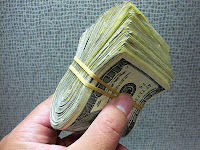 Every so often I come up with new ideas about how to make money. Some past ideas included the sand registry and personalized number combinations. You can't keep a good mind down and mine has been running full speed churning out the following ideas. The other day while listening to the radio, the song Renegade by Styx came on. I remembered how I was going to do a remake of the song a couple years ago but instead of saying Oh Mama..., I'd change the words to "Obama" and make a clever political song out of it. I'm sure it would go viral so I pretty much have that in the hopper to fall back on if I ever get around to it. I've also considered solving mysteries or being a bounty hunter. I've seen many shows like CSI and X files where they regularly solve cases in less than an hour. I don't get what the big deal is and why real life investigators take so long. I think I may give this a shot because there is some serious reward money out there. Consider this your warning Bin Laden! My crown jewel idea is the hot chocolate suit. I've been working on this idea for over 20 years. It's kind of like a camelbak, but an entire jump suit would be lined with a bladder that you could fill with hot chocolate or other warm beverage. You would just pop a straw out of the shoulder area during a game or camp out and enjoy your drink, while the liquid keeps your body warm. The deluxe version would have a catheter feature and an additional lining reservoir so you'd stay warm even longer and wouldn't have to miss any of the game. With all these great ideas I just can't figure out why I'm not rich yet. I'm actually more of a thinker and less of a doer, so if you end up stealing these ideas and running with them, please be kind enough to include me on some of the residuals. I have a confession to make. I don't ever watch the Superbowl. The last time I watched the entire game was when the Chicago Bears won in 1986. That was the era of Jim McMahon, Walter Payton, Refrigerator Perry, and the Superbowl shuffle. I'm pretty sure the mid 80's was the zenith of civilization so I don't feel like I've missed much since then. I still enjoy watching the funny commercials and I love watching the highlights, but I really don't feel like I'm missing anything by just catching the highlights of the game that night and seeing the best commercials on YouTube the next day. Maybe my apathy is made worse since I don't have a professional football team in my state. When I go to the store this time of year and see all the displays, I feel like I'm missing out on something. It's the food. There is a definitely pigfest that takes place on Super Bowl Sunday. I could totally get into the Super Bowl if I had friends who invited me over to watch it on a big screen TV and eat all kinds of good food. I'm sure it would be a great party, but they would probably catch on that I was just a poser when they realized I didn't have any NFL licensed apparel or when they noticed I didn't really care which team won. Don't get me wrong. I love football, but I think college football is much more exciting. I just have a hard time spending so much time watching a game. My favorite team used to be the Houston Oilers back when Earl Campbell played for them. I guess it's been a while since I've really followed the NFL. 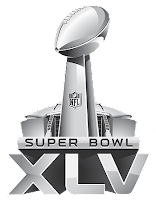 For all of you football enthusiasts, I hope you enjoy the food and the game as well as the several days of pre- and post game hype. I just found out today who is playing. I think the Packers are going to have a hard time with the Steelers. It's gonna be hard to beat Terry Bradshaw and Lynn Swan! 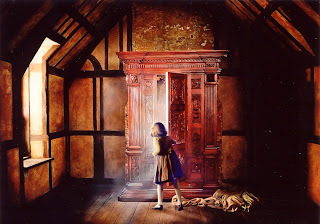 First of all instead of a closet, I'd climb up into the ceiling, but when I came out on the other side I'd be in a forest that smelled like fresh pizza. Instead of Mr. Tumnus I'd encounter a half man and half kitten named Mr. Coolness. He'd tell me that the kingdom was once run by King Gogofet who was a family man who was very just with his subjects, but after his death, the evil queen Shanistra who was out of touch with her subjects took control of the kingdom. She had a pet dragon in the her dungeon which was a man eater and she'd feed her disobedient subjects to it. He'd then tell me that the queen had many creatures and spies who act as private eyes for her and that we needed to go to a safe haven. Once there, he tells me about princess Sara. She is a rich girl and you'd think she'd be happy, but she's been under a spell from the evil queen and is unable to laugh. In fact there is a reward for anyone who might be able to make Sara smile. Just then the queen's guards broke in and I was so close to escaping but was finally captured and taken to the castle. She tells me that I must fight her to the death. I said I can't go for that and I don't fight women. She then laughs and says I can fight her dragon instead. I am then forced to do battle one on one against the dragon. She was shocked when I used my magical harp and defeated the dragon easily, what really made her furious was how fast I slayed it. I did it in a minute. Upon seeing the queen get so angry, Princess Sarah giggled and said "You make my dreams come true." There you have it. In my fantasy world there would be non stop subliminal references to Hall and Oates songs. How many did you recognize?